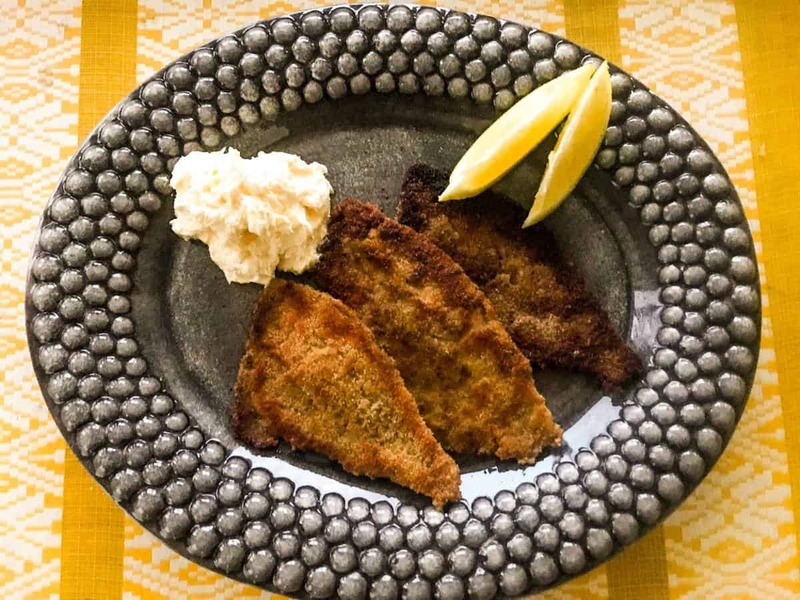 Pan-seared Breaded Plaice is really quick and easy to make and can be varied in so many ways! 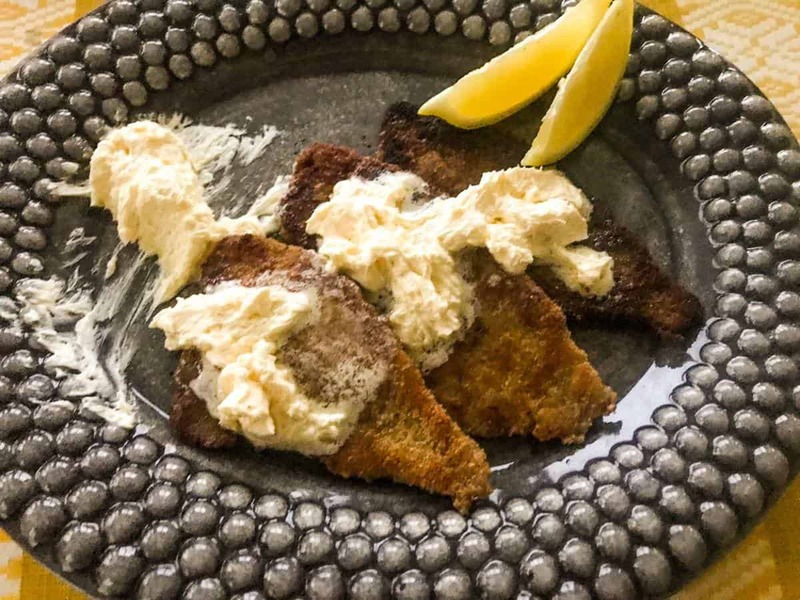 Here it’s served with a delicious Whipped Lemon Butter which I promise you will make over, and over and over again for anything from fish to vegetables to bread. As you may remember I come from a home where food is everything. Everyone cooks, everyone loves to cook, and everyone has their recipes that return over and over again. One of my dad’s returning heroes, when I was growing up, was Pan-seared Breaded Plaice, served with just lemon (but lots of it!) and rice mixed with butter, salt and pepper. Simple, quick, and absolutely delicious. When I left home this became one of my hero recipes as well, and I’m not exaggerating if I say I’ve made it almost every week since. Plaice is a great ingredient for weekday cooking as the filets are so thin and both thaw and cook quickly. I always keep frozen plaice filets on hand in the freezer and am always thankful when I get home, starving, with nothing in the fridge. Oh, and quite cheap as well! Just make sure you buy the MSC certified kind, so you know they’ve been sustainably sourced. While not so easy to cook as-is, plaice loves being breaded and pan-seared in lots of butter until golden. 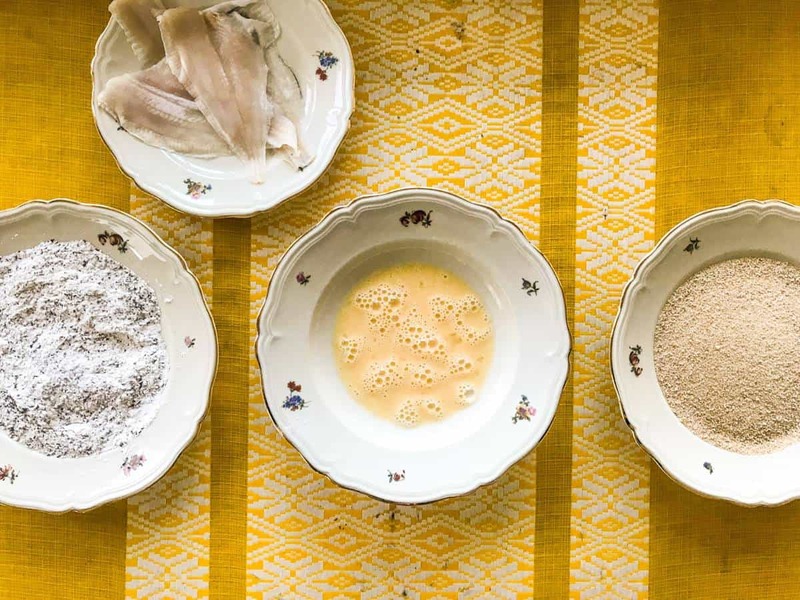 The perfect breading is made in three steps: flour, egg and breadcrumbs – and the secret to a delicious pan-seared breaded plaice is really in the flour and the seasoning you put into it. I’ve experienced a lot with this and I encourage you to do so as well! This recipe dried basil, salt and pepper, and this is also my personal favorite (as well as a great gateway plaice!). But I’ve also done all different kinds of dried herbs, mixed seasonings such as French seasoning or Italian seasoning, and even tried turmeric once. They’ve all been great! Just depends on what you like, what you’re in the mood for and what you’re serving it with. I promise, the Whipped Lemon Butter will love all of them. Now when breading the plaice filets – make sure you get everything everywhere. You want them to be completely covered in flour, then completetly covered in egg and, finally, completely covered in breadcrumbs. Another secret to a perfect pan-seared breaded plaice lies in the actual pan-searing. It requires a lot of butter, and just the right amount of heat. If the pan is too hot, the breading will burn, if too cold, it will soak and no one likes a soggy breading. I start my pan out over medium-high heat, add in the butter and then wait until it’s starting to brown a bit. I add in my breaded plaice filets and cook for 1.5 min per side, adding more butter as needed. The breading soaks up a lot of butter (that’s what makes it so delicious…) and you don’t want to risk the pan going dry. If you can’t cook all the filets in one go I recommend starting over with new butter for each round – otherwise, you risk ending up with really sad-looking filets. Golden brown is what we’re going for! A little burn doesn’t matter, and might even be tasty, but just not too much. 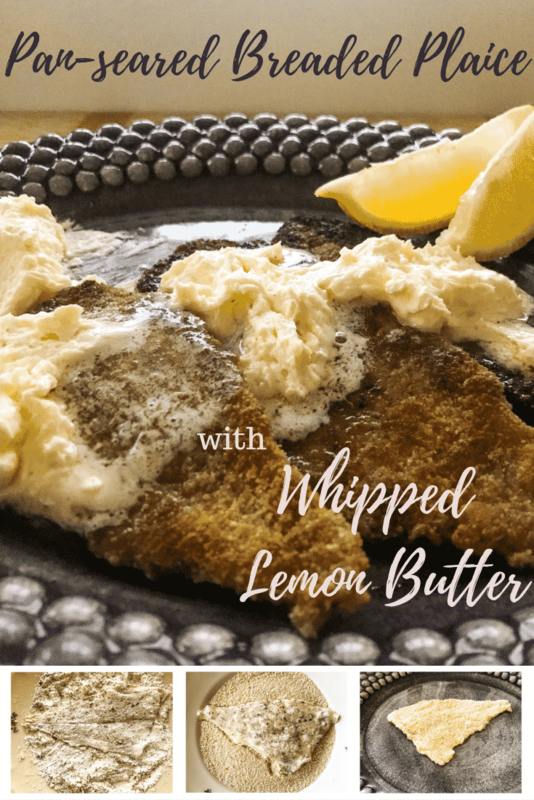 For this recipe, however, I elevated it a bit with one of my favorite condiments of all time – the very simple, very quick and extremely delicious Whipped Lemon Butter. It’s the perfect side for fish and vegetables (artichokes love it, as do asparagus) and delicious served on top of bread (but then again, what kind of butter isn’t?). Haven’t tried it with seafood but I can imagine that to be the ultimate combination. I’m not sure it’s possible to make this Whipped Lemon Butter just once. It’s too good. Once you try it you’ll probably end up making it over and over again. Don’t say I didn’t warn you!! 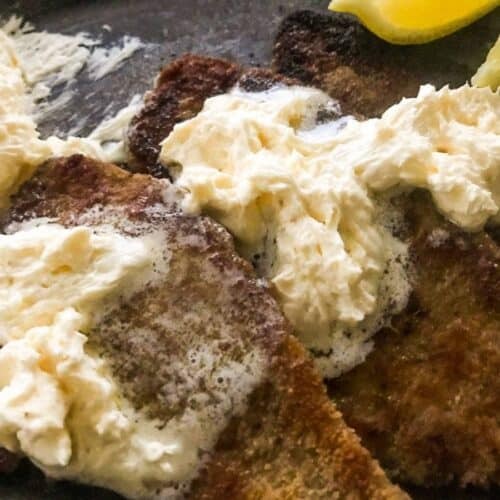 Enough about my Pan-seared Breaded Plaice with Whipped Lemon Butter – and off you go to cook your own! Don’t forget to tag me @alwaysusebutter if you post it anywhere – I love to see your versions! I’d also love for you to let me know what you think – the easiest way is by leaving me a comment and/or a rating below! Melt 20g of the butter, let it cool down slightly and then pour into a bowl with high walls. Cut the rest of the butter into smaller pieces. Using an electric beater, mix in the pieces of solid butter slowly, making sure that it’s completely mixed in with the melted butter before adding more. When finished, it should have the consistency of a hard whipped cream - if it’s too soft, add a bit more solid butter. Add the lemon juice and taste test. Add more as needed and season with salt. Set aside for now. If you want to serve with rice, start it now. Bring out one deep plate and two flat plates. Place the flour in one of the flat ones and mix in dried basil, salt and pepper. In the second flat one, whip the eggs lightly. In the deep plate, place the breadcrumbs. Also bring out a plate or other surface for placing the breaded filets on. 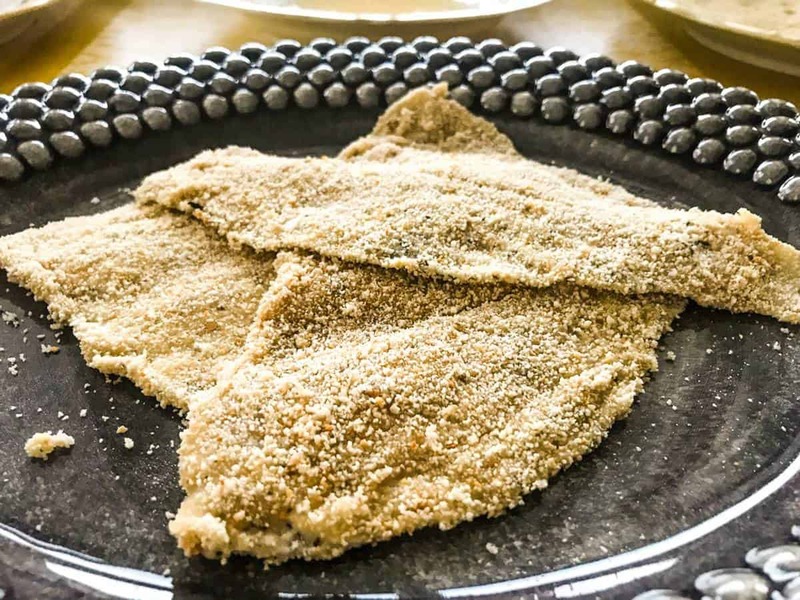 Take one plaice filet, pat it dry with a paper towel and turn it first in the flour mixture, then the egg and finally the breadcrumbs. At each step, make sure the filet is entirely coated. Place on a clean surface and repeat for all the filets. Heat half of the butter in a frying pan over medium high heat. When the butter has started to brown, place the filets in the frying pan and cook for about 1.5 min per side. They should have a nice golden color when finished, and a fork should slide through without any resistance. You might need to add more butter as you go along, as the breadcrumbs soak it up. Serve the plaice filets with the rice and place a good amount of whipped lemon butter on top of the fish, and add some lemon wedges. The seasoning for the flour can be varied in a million different ways - try different herbs and other spices to find your favorite! Some of my favorites (apart from this one) include French spice mix, Italian spice mix, turmeric and cayenne. If you're cooking more filets and need to do it in several rounds, I suggest starting fresh with the butter for each round, otherwise you risk ending up with really sad-looking filets. 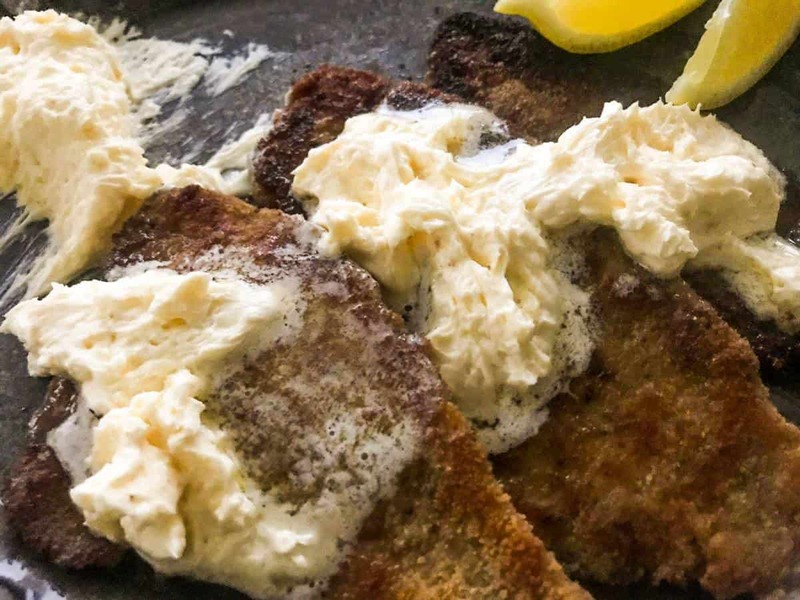 The Whipped Lemon Butter is delicious with just about anything - some favorites apart from fish include for dipping artichokes in, with asparagus or on top of a piece of bread.